This week's Pals Paper Arts Challenge is the sketch above. It was fun to come up with a design using that image as a starting point. That's what it's all about when you are playing along! 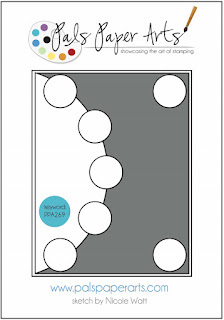 Make your card, photograph it and post it to your blog or any online gallery. Upload the link to the PPA site and you may be picked this week! My card base is Thick White card stock and the matt is from the Neutrals Designer Paper Stack. I used half of a Tea Lace Doily and layered on half of a Spider Web Doily over that. I edged them with Silver Sequin Trim and accented with Basic Rhinestones. My corners are 7/8" Scallops from Whisper White, a Black Neutrals Designer Button and an Iced Rhinestone. My sentiment is from Sheltering Tree and the script matches the background paper. I used Melon Mambo for some pop. What do you think? Won't you please leave your comment below? Tomorrow is the LAST CHANCE to join one of my paper shares! Here are the details. I still have spots open! Thank you! 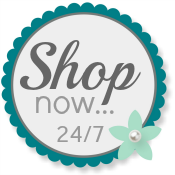 Shop my Online Store any time. WOW!!! Just fabulous Patti!! So, so creative!! Love Halloween!! It's so amazing how different and yet how amazing the creations. I looked at this sketch and couldn't imagine how I'd do it. Yours is perfect! I love the fact you relied on a single item to create the sketch! Brilliant! Thanks for playing with Pals Paper Arts! Patti, this looks wonderful! I love the details you added to this card and all the layers. I think my favorite part may just be the spider web and doily layering - they go perfectly together. I would have never thought of that! Thank you so much for joining us this week at the Pals Paper Arts Challenge!